Abstract: Web 2.0 tools are collaborative Internet applications that allow for facilitation of communications between individuals and organizations. Examples of Web 2.0 tools include blogs, wikis, Second Life, and social networking. 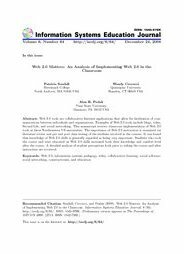 This manuscript reviews classroom implementation of Web 2.0 tools at three Northeastern US universities. The importance of Web 2.0 instruction is examined via literature review and pre and post class testing of the students involved in the courses. It was found that knowledge of Web 2.0 skills is generally regarded as being very important. Students who took the course and were educated on Web 2.0 skills increased both their knowledge and comfort level after the course. A detailed analysis of student perceptions both prior to taking the course and after instruction are reviewed.